"A Magento checkout extension that will reduce your customer abandonment and increase conversions." OneStepCheckout is the single most effective technical change you can make to reduce shopping cart abandonment. The original checkout process shipped with the Magento eCommerce platform took users through an overwhelming number of steps. That’s why decided to build OneStepCheckout to simplify it. We are all about increasing online sales conversion by reducing customer abandonment. We are addressing the key drivers for cart abandonment which are: unexpected costs not showing upfront, page loading speed, form filling complexity and unnecessary steps. Since 2010, we’ve been listening to thousands of customers to provide state-of-the-art user experience that removes friction while fulfilling merchant’s requirements. Improving your checkout process results in more visitors completing their orders, which drives an immediate impact on your bottom line. 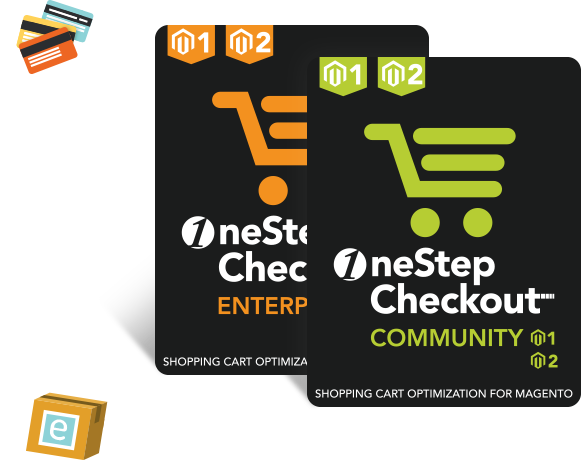 OneStepCheckout is a Magento extension that will reduce your customer abandonment and increase conversion. 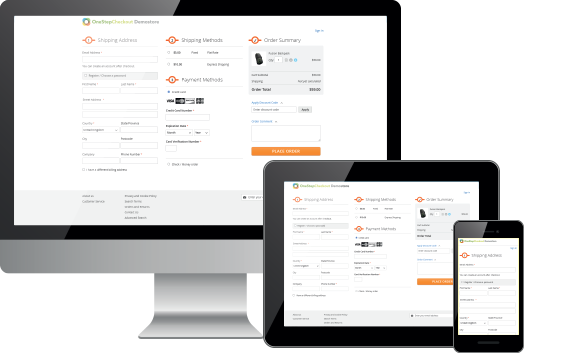 Our product simplifies Magento's native checkout steps into one with prices and totals dynamically updating via Ajax. Never before has checkout been easier and faster. 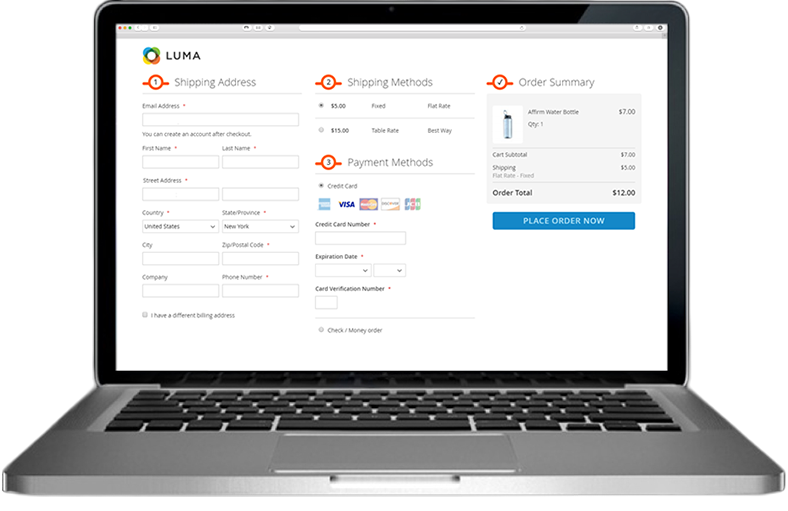 Our checkout is fully responsive and is very easy for merchants to install and customize. OneStepCheckout is a rock-solid, well documented, thoroughly tested extension and we provide support if you run into issues. We work exclusively with checkout and conversion, to always bring you the best possible checkout product. That’s why more than 20,000 merchants globally and 200+ partners are trusting us. THE CHECKOUT PROCESS IS CRITICAL FOR YOUR BUSINESS. OneStepCheckout is the single most effective change you can make to reduce shopping cart abandonment. Checkout is often the most complicated part of placing an order online, driving 7 out of 10 online shoppers to abandoning their cart (source: Listrak cart abandonment index 2016). OneStepCheckout greatly simplifies this process, by dramatically improving the user experience. Not only will it increase your immediate sales but also longer term return visits. Improve your user experience at checkout. Studies have shown how additional page loading is a big driver for cart abandonment. Not seeing payment methods nor order totals too. With OneStepCheckout, shoppers see all the information on one page, above the fold. The latest technologies have been used to make it quick and easy to fill out forms and review updating totals on all screen sizes. Boost your immediate sales and increase return visits. We know how much effort you put in to drive traffic to your online store. Wouldn’t it be a waste to see them go before they place their orders? When you make it easier for shoppers to complete checkout, you decrease cart abandonment and increase your sales conversion. Reap the full rewards of your marketing efforts! Download, install and you’re done. The OneStepCheckout extension comes packaged in a zip file like any Magento extension and is very well documented. Compatibility has been sorted out over the last 6+ years with the vast majority of payment providers, shipping providers and popular other extensions. Our support team is acclaimed by the Magento community and is always happy to help. Tried several checkouts and OneStepCheckout is the best. The checkout needed some tweaking and the guys from the support team did a very quick and good job. Checkout is the most critical area of an online store and no doubt it should be one of your #1 business priority. To customize your Magento Checkout the way you want, you shouldn’t have to set up big projects that often go over budget and timing. At OneStepCheckout we offer you a simple and cost effective solution. We have carefully designed our extension to cater for all Magento merchants needs whether they are on Magento 1 or Magento 2, big or small, run on Community or Enterprise Edition, have a single or multi-store set-up. Key reasons for shopping cart abandonment are poor user experience including long forms, site speed and not seeing all the costs upfront. This is particular true when visitors shop on smaller screens and mobile devices. Mobile traffic has soared in recent years and now constitute 30-50% of all traffic on many eCommerce sites. However, although time spent on Mobile is 50% higher than on Desktop, dollars spent on Mobile are almost 6 times lower than on Desktop. That’s why we made sure OneStepCheckout for Magento 1 and Magento 2 are Mobile Responsive and remove as much friction as possible to convert your shoppers into customers. The best way to have a feel for what your shoppers will experience is to have a play with our live demo. Simply choose between Magento 1 and Magento 2 below.